A wedding reception for 130 guests with separate marquees for the reception drinks and the wedding breakfast. 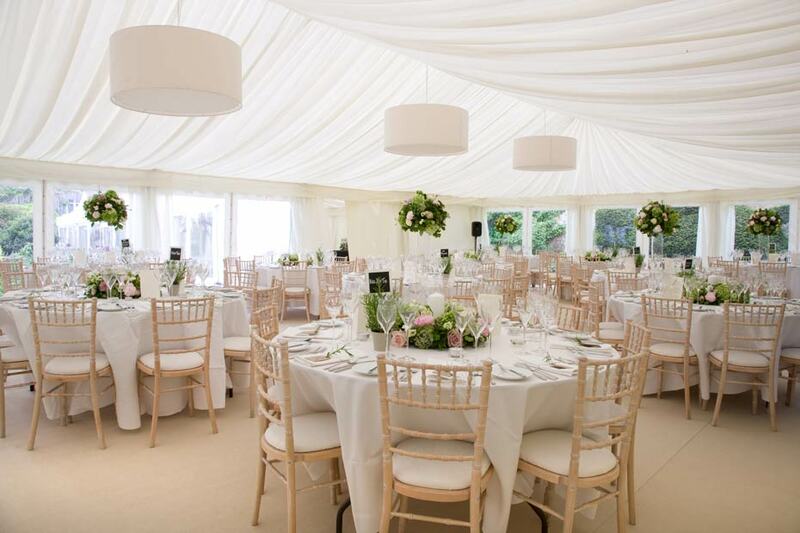 The marquee was at home in the garden and needed a catering marquee, a separate food prep area, mobile toilets, heating, a generator with electrical distribution to the kitchen, the stage, and for the marquee and garden lighting. The bride wanted a crisp, contemporary look. 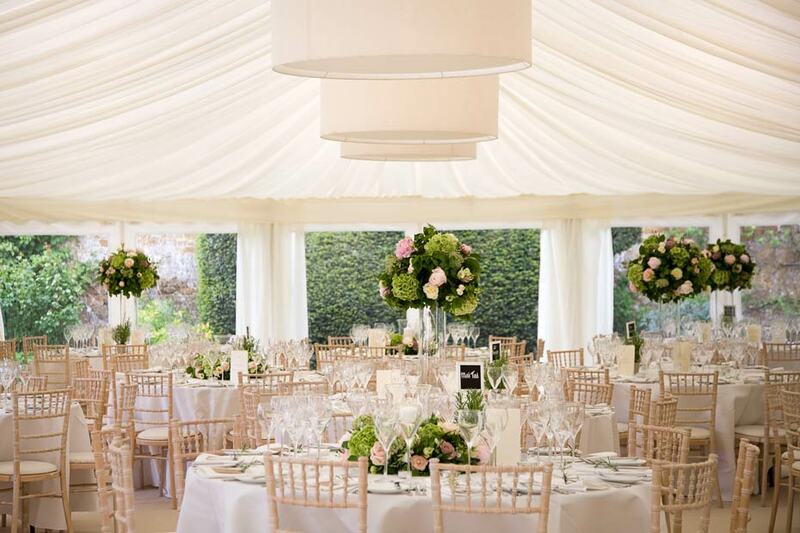 The marquee was set in a beautiful garden and she wanted windows wherever possible to make the most of the setting. The space was slightly narrow and on a slope. 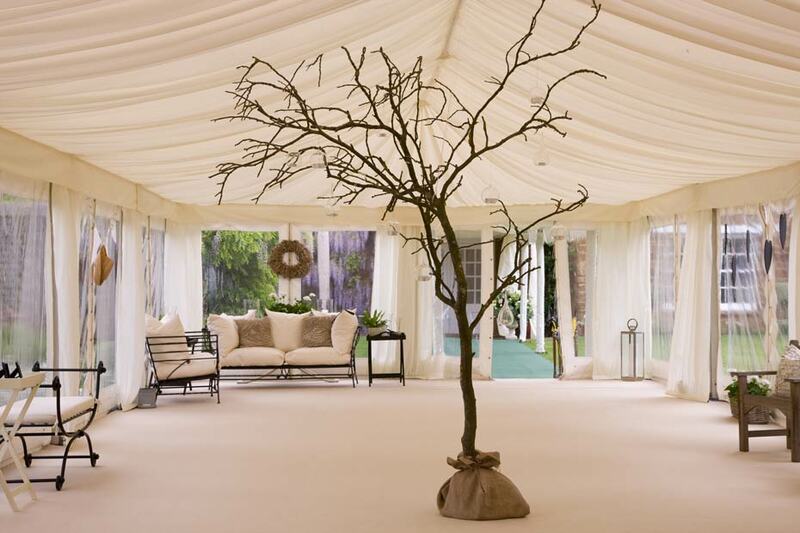 We used two marquees in an “l-shape” to provide the main spaces, and installed a wooden floor. The interior was finished with a pleated ivory roof with a flat valance. We used flat ivory wall lining where windows would not have worked. The marquee had a nut carpet. We used oversized pendant drum lights in the dining room and up lights throughout. Circular dining tables had ivory lime-washed Camelot chairs with ivory seat pads. Access to the site was tricky with lorries needing to come through a narrow gateway and travel over grass. The loos where not delivered until everything else was finished so that they could be positioned without blocking access to our crew. 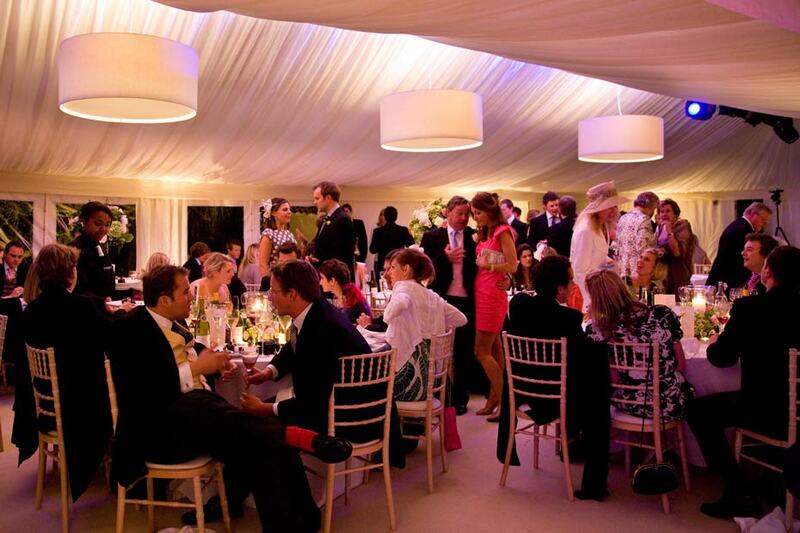 Marquees & Pavilions provided all of the structures and infrastructure, the dance floor, bar and dining furniture. The lounge furniture in the reception area belonged to the client. Catering was provided by Indulgence based in Farnborough, nr Banbury. Photography by Barker Evans in Oxford.